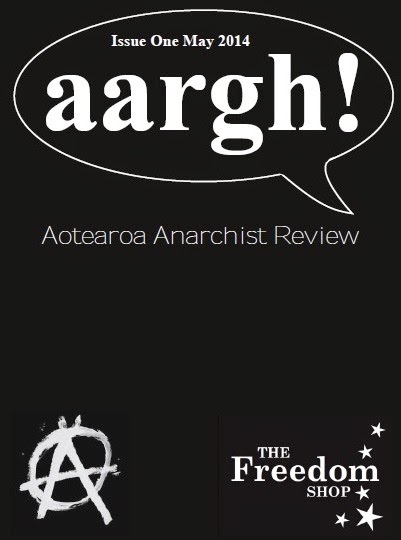 The Freedom Shop has just published issue one of a new periodical titled ‘aargh!’ (which apparently stands for ‘Aotearoa Anarchist Review and Golfing Handbook’). 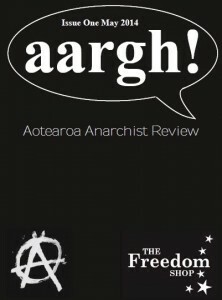 The 16-page publication claims to “maintain the proud tradition of anarchist publications in Aotearoa. Which in the last ten years include Snap!, Imminent Rebellion, Dissident Voice, The Wildcat Annual, Aotearoa Anarchist and Solidarity.” We agree! The Freedom Shop Collective is Aotearoa’s longest running anarchist group. Founded on 1st May 1995 in Wellington, the shop is currently situated in the Opportunity for Animals op-shop at 162 Riddiford Street, Wellington. The shop has had its ups and downs, which included a stint of homelessness a few years ago. The collective has never produced much material themselves but tended to order books from AK Press and re-produce pamphlets and zines from around the world. While the cover of ‘aargh!’ doesn’t match the design aesthetics of Rebel Press publication Imminent Rebellion, the content is superb. From the opening stanza of Airini Beautrais’ poem about Whanganui police computer bomber Neil Roberts to Sam Buchanan’s film review (‘Rebellion – L’ordre et la morale’), ‘aargh!’ is a jolly good read! Airini’s poem is based on a 1982 newspaper quote describing the anarchism of Neil Roberts: ‘a sad, fippant kind of nihilism.’ The poem is a journey through the anarchist past from Proudhon to Kropotkin and Malatesta and ends: ‘When we can’t dream any longer,’ said Emma Goldman, ‘we die.’ We can look forward to more of Airini’s poetry in a forthcoming book of poems about Neil. Wellingtonian Murdoch Stephens is currently leading a campaign called ‘Doing our Bit’ which aims to double the quota of refugees who arrive through the UNHCR resettlement programme. While this is certainly a laudable campaign, it doesn’t challenge the fact that any quota on refugees goes against any principles associated with the concept of ‘refuge.’ Refuge is a need, and not something that can be crammed into numbers, quotas and statistics. While Val shares some thoughts on privacy and surveillance and points out that anarchists “have been remiss in acknowledging that surveillance is not experienced equally,” Sam Buchanan looks at the situation in Syria. He writes that isolationism and inaction is not a moral option and draws a comparison to the Spanish Civil War where the “supposed supporters of democracy (with the slightly honourable exception of the Mexican government) remained aloof.” 20,000 rifles and 20 million cartridges from Mexico for Republican Spain – that was news to me! Sam’s rant against bureaucrats (“Bureaucracy – taking the ‘demos’ out of democracy”) will resonate with anyone who has ever bothered to attempt to engage with district or regional authorities. He uses his own experiences, such as working in the international development sector where bus-loads of bureaucrats lost their jobs during sever funding under Murray McCully. McCully implemented his neo-liberal version of development. Sam observers: “This isn’t typical. Most often, the policies of a politician do not get put into practice – they are stymied by bureaucrats.” District and Regional Councils are full of bureaucrats who think they know it all and sit in their powerful seats for decades while elected representatives come and go. For anyone who follows local politics, it is really quite astounding just how little authority councillors have over these organisations. As a newly elected member of the Paekākāriki Community Board, it will be interesting to see if Sam can control the bureaucrats on that level. Fellow anarchist and two-term Gisborne District Councillor Manu Caddie, recently quit Council “after some significant soul searching following a recent family trip to Asia and discussion with family and close friends.” Could it be that the bureaucrats got to Manu? Keep us posted Sam! Glammarchist briefly explores the ‘go-slow’ as an industrial tactic under the title: “Workers of the world: relax!” Couldn’t agree more. The go-slow is used widely and regularly across Aotearoa and the world. Not often in an organised fashion, but as small acts of rebellion and direct action against the capitalists. Molly McGuire’s recipe – Black Bean Chilli with Cornbread – is yummy (tried and tested). Thank you. And then Sam finishes it all off with a film review looking at French film ‘Rebellion’ about the struggle by the Front de Libération Nationale Kanak et Socialiste (FLNKS) in Kanaky (New Caledonia). Superb film. There really isn’t much to criticize with this Freedom Shop Collective publication. It would be nice if it was made available online for download. You can order a copy by writing to FreedomShopAotearoa@gmail.com or write Freedom Shop, PO Box 926, Wellington 6141, Aotearoa (NZ). According to their website (http://freedomshopaotearoa.blogspot.co.nz), the shop is open Tuesday (10am – 5pm), Thursday (9.30am – 5pm), Friday (3.30pm – 5.30pm), Saturday (1pm – 4pm) and Sunday (11am – 2pm). We look forward to Issue Two!